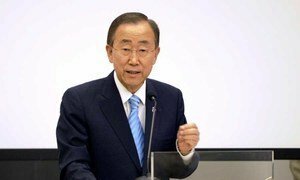 Secretary-General Ban Ki-moon today spotlighted the progress made by Bangladesh in advancing women’s and children’s health, lauding the South Asian nation for its efforts to end the tragedy of millions of needless deaths. Last year Mr. Ban launched the Global Strategy for Women’s and Children’s Health, which has received the support of many developing countries, including Bangladesh. The strategy is supported by Every Woman Every Child, a global effort to mobilize and intensify global action to save the lives of 16 million women and children and improve the lives of millions more. “Bangladesh showed its vision early on,” Mr. Ban noted at a dinner held in the capital, Dhaka, in support of the initiative, adding that the Government met the challenge with ambitious plans. These included bolstering the health workforce, doubling the number of babies who are born with the supervision of a skilled health worker, and making sure that all health centres in all sub-districts have a midwife available at all times, day or night. This dedication paid off, said Mr. Ban, noting that Bangladesh is one of only 16 countries on track to reach the Millennium Development Goals (MDGs) to cut the deaths of mothers and children. Earlier in the day, the Secretary-General travelled by helicopter from Dhaka to the north-east region of Moulvibazar, where he visited a community health clinic to spotlight the importance of ensuring access to women’s health care in rural areas. He also met with officials from BRAC, a non-governmental organization (NGO) that works on health and development. Mr. Ban told reporters that through these visits he was able to see that the Government has been investing in people – investing in smart ways to save lives and give people hope. Bangladesh has “risen from great hardship to build a thriving economy, a vibrant civil society and a dynamic future,” said Mr. Ban, hailing the country as a tremendous global partner, the top contributor of UN peacekeepers and a leading voice for least developing countries (LDCs). The Secretary-General also highlighted the progress made by Bangladesh in an address at Dhaka University, where he was given an honorary doctorate. He told the hundreds of people gathered that if Bangladesh is to create the prosperous future that it deserves, it will only do so through national unity and common cause. Bangladesh, he also pointed out, is a nation in democratic transition. Commending the country on the peaceful conduct of the 2008 elections, he stressed that it is essential that future ballots be carried out in a free, fair and credible manner and that all political leaders look beyond party lines and work together for the country’s future. As part of his last day in Bangladesh, the Secretary-General also spoke to the Board of the Global Alliance for Vaccines and Immunization (GAVI Alliance). He also held a bilateral meeting with the Finance Minister, Abul Maal Abdul Muhith, following his meetings yesterday with Prime Minister Sheikh Hasina, Foreign Minister Dipu Moni and the leader of the opposition, Begum Khaleda Zia. The discussions focused on a range of issues, including Bangladesh’s role in advancing women’s and children’s health, disaster risk reduction, sustainable development and peacekeeping. The next stop on the Secretary-General’s three-nation tour will be Thailand, followed by Indonesia.